Make Baby Care Away From Home Hands-Free! Let's face it, in today's world there are plenty of distractions. And lots of stuff we like to tote around with us everywhere we go. And for moms there are the actual necessities like fresh diapers! This terrific stroller organizer can handle it all: from drinks and snacks, to keys, wallets and phones. It'll will make trips out with strollers so much easier. No need for bulky bags. This one can carry everything you need! Moms who love getting outside and getting fresh air and exercise will truly appreciate what this organizer can do. They can go for a stroll with baby knowing they'll have everything they need close at hand. And trips to the mall will be so much easier too! Who's Getting The Kudos For The Great Shower Gift? Yes you'll be the thoughtful friend or family member who saw this wonderful baby stroller accessory and knew she just had to have it! And since it smartly fits almost all types and models of strollers, you just can go wrong with this gift. Of course, it doesn't have to be a shower gift, it's an amazing present for moms year round! Don't Forget Our Money Back Guarantee! We stand behind our products. So if for any reason you're not completely satisfied simply return it for a full refund. No questions asked! Order Your Baby Stroller Organizer Today! Don't wait until the due date! Get this this premium quality baby accessory now! VERSATILE ORGANIZER FOR STROLLER CAN HOLD MULTIPLE ITEMS: This stroller bag has several compartments to hold special items. There is a double insulated cup holder for water bottles and sippy cups, an interior compartment for diapers, and plenty of room for wallets, keys, toys and snacks too! DON'T SETTLE FOR CHEAP STROLLER ACCESSORIES: This attractive black stroller organizer is made of high quality materials and is built to last. 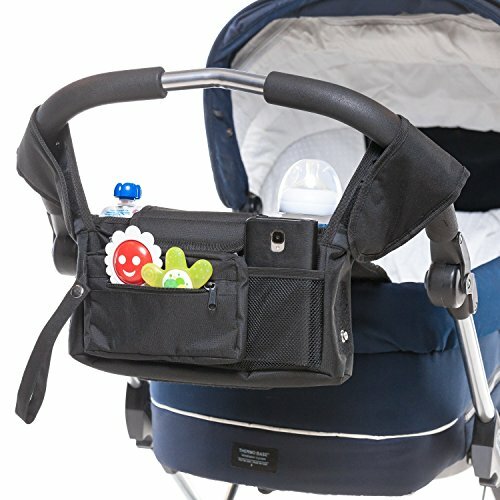 Our baby organizer attaches easily to the stroller's handle bar, and smartly has both velcro and snap fasteners and so fits most every stroller out there. MULTITASKING MOMS WILL LOVE IT: Taking care of babies is a very hectic job! So many items for busy moms to keep track of while ensuring baby is safe and happy. This large stroller organizer can handle everything she needs to bring along on walks or trips to the mall. Dad's will love it too. MAKES A GREAT BABY SHOWER GIFT: This stroller organizer makes a fantastic gift for expectant mothers! They will love how it helps keep everything they need handy, from diapers to electronics. It also makes a great gift year-round - and if there's a new dad in your life he'll appreciate it as well! 100% SATISFACTION GUARANTEED: We're sure you just love this quality stroller bag organizer but if for any reason you wish to return it we'll give you a full refund - no questions asked! If you have any questions about this product by winstig, contact us by completing and submitting the form below. If you are looking for a specif part number, please include it with your message.